There is no better way to experience the magic of the Makgadikgadi than from horseback. The sense of freedom, silence and tranquillity, with a touch of adrenalin thrown in too, brings you closer to nature than you may have ever been before. From the back of a horse you will see things from a different perspective as you ride with the herds of zebra, wildebeest and springbok. The open nature of the terrain makes it a wonderful environment for anybody to ride – even if you have never been on a horse before! Our horses are calm, well-trained and perfectly relaxed around the wildlife. 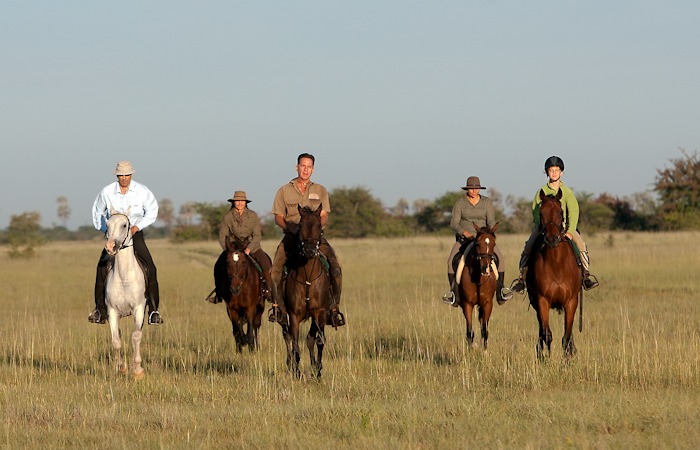 Daily two hour rides, led by an experienced and knowledgeable guide take place every morning and afternoon from all of Uncharted Africa Safaris’ camps – Jack's, San and Camp Kalahari. These should preferably be booked in advance, but may also be booked upon your arrival in camp. A selection of hard riding hats is available. Talk to us about a Botswana safari adventure.